Captain Arf, a daring Pirate Warf who commands a tiny nautical vessel, does not hesitate whenever he has an opportunity to eat. Docked beneath the Golden Dubloon in Krawk Island, Captain Arf's ship is usually greeted with leftovers from the restaurant, which the captain promptly devours. Unfortunately, Captain Arf has a habit of eating right before setting sail and he soon becomes sick. His crew, concerned with the intense rocking of the ship, come up from below deck to check on him. When the situation seemed bad enough, the captain is now puking all over the ship! Help Captain Arf steer the ship and keep his crew on board! 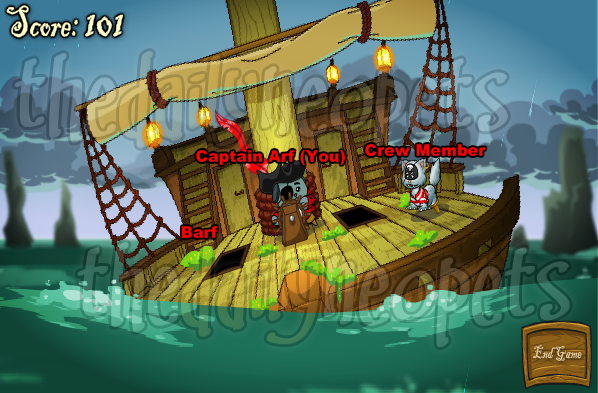 The objective of Barf Boat is to maintain control of the ship and not let all of Captain Arf's crew fall into the ocean. Hazardous obstacles such as bombs and the ocean are out to stop this wild boat ride. The left and right arrow keys controls which side the ship will lean towards. Pressing the space bar commands all of the crew currently on deck to jump upwards. Bomb Bombs. These explosive items are obviously something to stay a good distance from. Often appearing on the ship's deck, bombs will attempt to knock Captain Arf's crew into the ocean. Bombs will appear in a couple of different sizes, ranging from small to large. All the bombs, however, are easily capable of knocking any Petpets off the ship if they are not in a safer spot. Coin Coins. Worth the total amount of 30 or even 300 points, coins will occasionally appear on the ship. The points are only awarded when a crew member makes contact with a coin. They can leave as quickly as they came though, so it can be tricky when trying to catch them. Barf. As the title of this game implies, barf is sure to make a lot of appearances during game play. After the ship has rocked back and forth for a short while, Captain Arf will become ill again and vomit on the ship. Barf has no real effect on the game other than being a distraction to the player. A hint that signals when he will barf is the current color of his face. Each shade of green on his face is a sign of how close the captain is to barfing. Six different types of Pirate Petpets are present within Captain Arf's crew. Throughout the game, crew members will come up from below deck to see what the problem is. The ship, fighting against the crashing waves, needs to balance the Petpets so no one falls overboard. Take notice that the score increases every second depending on how many Petpets are currently on the ship's deck. A single Petpet is worth 3 points for every second that it is aboard the ship. Each additional Petpet is worth 2 points. For example, two Petpets on the deck would be worth 5 points per second, while five Petpets would be worth 11 points. Barf Boat has an alternate form of game play called "Extreme Mode". This mode works exactly like the normal one, but with several differences. Now, instead of the ship, Captain Arf must command a tiny rowboat. The objective of the game still remains the same as before; keep the crew from going overboard. Scoring has slightly changed, as the Petpets are worth double the points. A single Petpet is now worth 6 points per second and each additional Petpet is worth 4 points. So if there were two Petpets on the boat, for example, the score would increase by 10 points per second. Note: This mode helps score points faster, but it also is much more difficult. One of the largest reasons for losing all the crew members is because of the bombs that continuously find themselves bouncing around on deck. To rid the ship of any bombs, try carefully leaning towards one side in order for them to slide off into the ocean. Sometimes a bomb will come between several of the Petpets. Press the space bar for all of the Petpets to jump upwards into the air and lean the ship to either side to force the bomb to slide out from under the crew. Bombs only last for several seconds before they explode, so be quick when deciding how to avoid them. Captain Arf's crew members can prove themselves difficult to keep on the ship. It is important to remember that the Petpets will weigh down the side they are standing on. So, for example, a Petpet on the right side of the ship will make it lean to the right. In this case, the right arrow key should be pressed to counterbalance the Petpet. The more Petpets that are on the ship's deck will make balancing the ship tougher to accomplish. If several Petpets slide to either side of the ship, it becomes noticeable how their combined weight will affect the balance. When it becomes difficult to counterbalance Petpets, press the space bar to relieve weight on the ship. As long as one Petpet remains on the boat the game will not end. Barf Boat may likely cause lag on older computers since it is one of the more advanced flash games regarding visualization. To help increase its performance, visit the game's main page and look for the box on the lower right side that reads "Game Options". On the drop down list underneath "Select Game Quality", choose "Low" as the preference. If lagging still occurs, change the game size also to see if the game play improves. Despite what the title may suggest, Barf Boat is by no real means a bad game. Once balancing the ship becomes more natural to pull off, earning a decent amount of Neopoints should hardly be a problem.